Even in winter, there’s a certain charm to Taupo; a distinct warmth that you can’t put your finger on. It’s certainly not a sleepy little village … there’s a buzz, a vibrancy, an energy, yet it retains a relaxed atmosphere that encourages you to unwind and explore. A geographical masterpiece, Lake Taupo is the result of a massive volcanic eruption – the largest in the past 5,000 or so years – and the geothermal activity can still be witnessed. Located quite literally in the centre of the North Island, it’s reached with ease, no matter which direction you’re coming in from. Drive yourself on State Highway 1 from the north or south, fly in from a range of locations, bus in by coach. 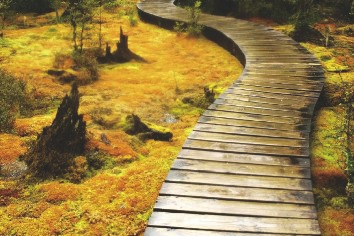 Why not explore the Thermal Explorer Highway (SH5), from Rotorua through Taupo and on to the Hawke’s Bay! When it comes to accommodation, I found there was no shortage of variety in terms of style and price. From luxurious hotels and world-class lodges to quaint bed and breakfast offerings, backpackers and motels, there is something to suit every budget. 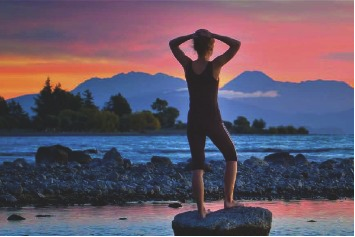 At the Millennium Hotel and Resort Manuels Taupo, you’re so close to the lake that you feel you could reach out and touch it. Step from your lakefront room right onto the beach, and awake to the ducks waddling past your window in the morning. In-house dining at Edgewater Restaurant offers a magnificent location with fabulous views over the lake. It has a long standing excellent reputation as being one of the best restaurants in Taupo with award winning cuisine, comfort and ambience second to none in the region. Alternatively for a more relaxed dining experience the Beach Brasserie and bar is a favourite with locals, families and hotel guests for all day dining, breakfast, lunch, dinner and any in betweens, even coffee to go. Also popular for al fresco dining on the water’s edge on sunny days. Beach menus feature favourites using the freshest NZ produce, and offer a la carte, special children’s menu and scrumptious holiday buffets. The heated swimming pool was just the ticket on a chilly day, as was the sauna! Suncourt Hotel & Conference Centre is also lakeside offering majestic views over the lake to the nearby volcanic mountains of Ruapehu and Tongariro. Spacious and affordable rooms make it perfect for family holidays, with the vast majority offering those great views. Chill on Northcroft’s roaring fire makes for a great spot to enjoy some fine dining in comfort. At Bayview Wairakei Resort you’ll enjoy an historic setting that visitors have enjoyed since the late 1800’s. Beautifully manicured grounds encompass some 160 plus acres, including it’s own 9-hole golf course. A range of accommodation options, tennis courts, thermal hot pools and two restaurants, make this a popular choice. Taupo and golf are two words often linked. In fact, within 20 minutes drive of the Bayview Wairakei Resort you’ll discover four top class 18-hole courses! The best word to describe Wairakei International Golf course is epic. It’s like golfing in a botanical garden – the majestic trees and native plant life are worth the golfing fee alone. The property has had a recent $2 million ecological restoration, complete with a pest-proof fence, making this a sanctuary for bird and plant life. Whilst not in Taupo itself, Tongariro Lodge just north of Turangi is worthy of mention. Situated on the southern shores of Lake Taupo, the lodge has a reputation as one of the world’s best fishing lodges. It’s exquisite without being pretentious … glowing timbers, roaring fires, individual chalets and park like grounds. Of course, the trout fishing is magnificent, but there’s also a spa, tennis courts, 22 acres of land to discover, petanque and much more. A destination unto itself! Since we’re at the southern end of the lake, it’s also worth mentioning Oreti Village, another lakefront location that forms part of the historic Grace Mission Station. Accommodation here is in a range of apartment sizes, all fully equipped with kitchens and all the mod-cons. Take a meander down the tranquil bush track past the Oreti Waterfall as you make your way down to the lake. Oreti Village is designed for relaxation and the private decks are just the spot to enjoy a good book or a glass of wine. So what do you feel like doing today? It really depends on your mood and the weather. Perhaps you’d enjoy a charter on the lake, either for fishing or merely relaxing, or the more active can parasail, wakeboard or waterski. Still on the water, there’s the thrill of jetboating along the Waikato River along to Huka Falls, taking in the impressive Aratiatia Rapids. The Tongariro River is perfectly exciting, wet and wild if you’re after a spot of whitewater rafting, while a more serene kayak will allow you to paddle and drift, taking in the 10m high Maori Rock Carvings that are only accessible by boat. A visit to Huka Prawn Park is an absolute must – your trip just wouldn’t be complete without meeting “Shawn the Prawn”! This is the only prawn fishing park in New Zealand. Try your hand at actually fishing for your prawns. There’s no catch limit, and they’ll even cook whatever you catch for free. Kids will love the experience of feeding the baby prawns, and I just know that every mum and dad will love the dining experience (yes, there are dishes without prawns!). One day in particular, it was bucketing with rain, so I headed off to Plateau. Whilst it may look slightly pretentious from the outside, once you’re in the door, you’ll feel that typical Taupo warmth exuding from a funky yet laid back ambiance. I was delighted to see families returning from the lake with their catch of trout proudly in hand, and seeing this trout handed over to the chef to be prepared. So long as your catch is in by 5pm, you’ll enjoy a scrumptious dinner prepared in style. I didn’t have a fish to deliver, so instead enjoyed a melt-in-the-mouth braised beef dish to start, followed by one of the Monteiths Wild Food Challenge dishes – Wild Razorback Boar Ragout with homemade pappardell – absolutely spectacular! L’Arte Mosaic Café and Gallery is described as a visual and edible feast, and I can vouch for that! Judi’s mosaic pieces line the paths, hide amongst the mature plantings and line the gallery walls and shelves. In the café, all food is prepared fresh on site, the aromas of homemade breads and jams as enticing as I remember from mum’s kitchen! A small Deli ensures you can take some of L’Arté away with you. Art Lovers will discover a dream world of extraordinary dimensions – a place not to be missed! Unfortunately, I only enjoyed a very brief stay in this magic playground, and there was so much to see and do that I only scratched the surface on my bucket list. However, as Arnie said… I’ll be back!